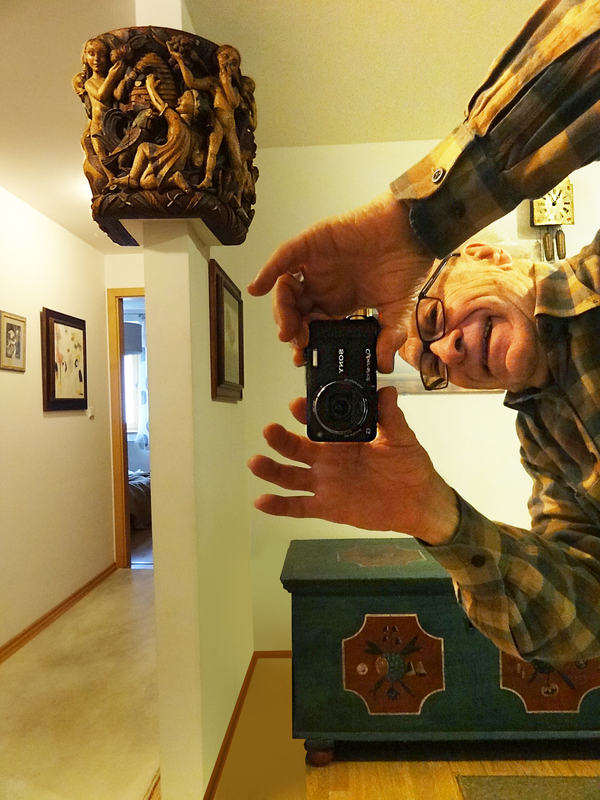 It’s been a long time since I was born, left-handed and eager, and as I write this blog/book at age 88, I’m lucky to still be extant, and still able to communicate. 1. Not for money, it’s a full time, no-pay job, which costs me money. 2. For myself. I’m doing it in the belief that it may conceivably ward off dementia; it’s taxing my memory to the max. 3. For you, in the possibly misguided belief that my creative adventures and strivings might ring some of your bells, and even be useful to you; at least hand you some laughs, and at best show you some interesting stuff you didn’t know about. I’ve been extremely lucky, doing what I’m advising strivers to do in my other blog, “How To Succeed in Animation,” (With forbearance, you can read it all at awn.com/genedeitch) My advice on that site is: “Make Luck Happen.” I explain there some ways how to do it. I’ve made several talks about idea creation. I wished that the headline on that 1958 article had read, “Deitch, The Creative Problem Solver!” That in fact is what I have tried to be. John Hubley taught me that a proper film story has to be “about something.” Not all film writers care about that. Commercial clients came to me with simple-minded problems. They wanted to sell a product. I would have to ask myself, “Why did they make it? To fill a presumed or imagined demand? What does it do better than any other similar product? Why do we need or want it? What happens to us if we go on without it? How will this thing actually improve our lives? In most cases all of the answers will be negative. Our ideas were needed, but the best ones were rarely used. But beyond advertising; beyond selling, just look at the world around us. Problems abound! Some seem impossible to solve. The weather! Weather patterns right now appear to be rapidly and widely changing for the worse. Floods, Tsunamis, heatwaves, earthquakes, tornadoes, lightning strikes, snow storms… in rapid succession… challenge our material and financial resources. Can we cope with, or change the weather? Politics! Conflicts! Hatreds! Jealousy! Violence! War! Power Struggles! Thievery! Destruction! They all threaten our peace, our property, our lives. All huge problems! From time to time, individual thinkers, activists, leaders, preachers, ideologists emerge, promise solutions and gain followers. Most of us are hardly up to that, and can only focus on our micro problems; raising our kids, getting and keeping a job, getting rich, or at least avoiding poverty, being and staying healthy, being safe. Some of us would actually like to repay the luck of our birth, widen our interests, and actually make a difference in the world. Is that realistic? Some of us try to think beyond ourselves and teach our children to do likewise; to attempt to do something meaningful, to better our families, our communities, our world! There are plenty of problems needing solving. The first question is: are we educated enough to solve any of them? Are we capable of producing something useful? Package and distribute good products? Cure a disease? Improve government? Fight crime? Support education? Eliminate waste? Clear our air and waters? Ideas are needed! Ideas are formed when creative minds are confronted with specific problems! It’s a step-by-step process. All of the people I have written about in this blog/book had ideas. They showed me the many ways they found to confront and solve problems they faced, some trivial, many meaningful, all inspiring to me. I have learned from them. I hope they will remind you of people you knew and who inspired you. I’ve been extremely lucky, doing what I’m advising others in my other blog, “How To Succeed in Animation,” (With patience you can read at awn.com/genedeitch ) My advice on that site is: “Make Luck Happen.,” I explain some ways how to do it. I’m lucky enough to have had so many people boost me, help me and work with me. I’m always aware of the fact that all the honors laid on me by many festivals and film societies, the goldish statuettes and medals, and all the great publicity, should include my many great colleagues who worked with me. I am not a one-man-show-doing-it-all-by-myself. I can take credit for thinking up some stuff, and giving others some ideas how to make it work, and doing a lot of the work myself, but there’ve been a lot of brilliant people who have done amazing things on my films to make concepts a reality. That’s why I’ve been “Rolling The Credits” with this blog! The many animation writers and historians that have honored me in their magazine articles and book chapters, and the school and film organizations that have actually paid me to speak to them, surely realize that I’m not Frederic Back or Norman McLaren. I have rarely made a film all by myself. I have always enjoyed the input and support of a studio full of talented people; colleagues and friends! 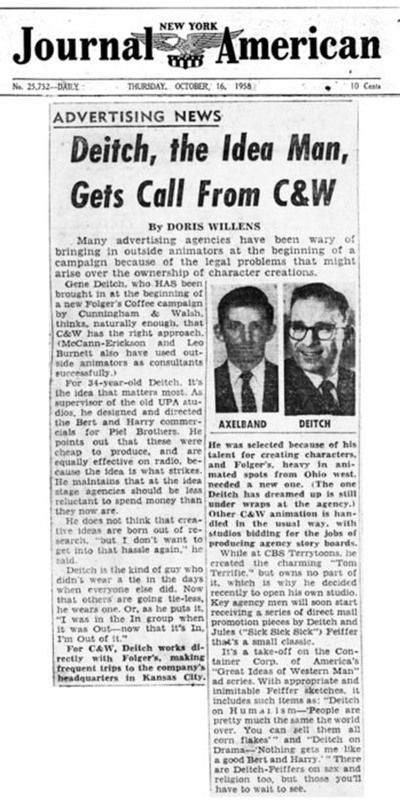 Among the professional animation boosters I owe great thanks to are Jerry Beck, Gian Alberto Bendazzi, John Cech, Karl Cohen, Shamus Culhane, John Culhane, Gary Groth, Leonard Maltin, Dan Sarto, Joe Sikoryak, Amid Amidi, Gunnar Strom…and many more. It was Jerry Beck who suggested that I write this book, and who has gifted me with his advice, and publicity. Many thanks to him and to all those clients who have fed me with an uniterrupted flow of steady work over a period of 65 years. I don’t mean to pass over Jerry Beck that quickly. He was actually the Main Man in prompting and supporting me with “Roll The Credits!” His encouragement, tips, and publicity got me off the ground and kept me aloft from beginning to end! His and Amid Amidi’s Cartoon Brew site is the main force in keeping alive the tradition of drawn animation, which I believe continues to be the most unllimited future of animation. The millions of years in the development of graphic art simply cannot be rubbed out by CGI! To Jerry, and to all the other people I should also be thanking (if I just could remember all of your names!) I extend not only my thanks, but the hope I will hear from them, their thoughts and ideas! genedeitch@me.com. For the great technical work this blog has needed and will continue to need, I thank Zachary “Hary’’ Jordanov (PixelPUSHERZ.eu), an artist in his own work, fellow striver, and Apple computer master, for his help in constructing and maintaining this site, while patiently coaching me how to do the posting myself. Now it’s time to “Roll the Credits!“ Here is a partial list of greats who worked with me during my 65 years in animation; people who made me look good! During the short period between the the mid 1950s and the mid 1960s, when I was directing theatrical shorts distributed by 20th Century-Fox, MGM, and Paramount, five films I directed were nominated for the Hollywood Oscar. One of them, “MUNRO,” actually won the golden statuette. Who really made “MUNRO”, and who’s name is on the Oscar? The answer to that question is a clear example of the point of this book. Usually, only one person gets the Oscar each year for an animated short film. Many people made important, significant contributions to this little 6-minute cartoon film. So who deserved the Oscar, and who actually got it??? OK, but I’ve gotten the credit….. It occurs to me now, with this new blog, “Roll The Credits,” posted as I am pushing 90, that it is THIS, actually putting out my thoughts and drawings – publishing – that is my true lifetime career, which began with poop on the wall by my crib, and on paper at the age of 8. Animation was just a 65-year sideline! Sadly, samples of my earliest ventures into self-publishing with carbon paper and hektograph, are lost forever. Only a few copies of the mimeo Hollywood STAR-NEWS still exist, as shown in chapter 3. And I am now preparing for Fantagraphics a new book revealing the back-story to my creation of NUDNIK, the 13-fim Oscar nominated theatrical series, distributed by Paramount in the 1960s. It soon became a once-a-year periodical, until it was possible to put it online. Below is what it looked like for 12 years, printed on green paper with one of the early dot-matrix printers. Further down, you can see that when low cost color inkjet printers were available I switched to white paper. By the year 2000, when my mailing list grew to the point where I couldn’t manage the work and cost of printing, addressing and mailing over 200 copies, the new possibility surfaced of posting the magazine on the internet. So “The Occasional Deitch” exists still today, “occasionally” updated, at www.genedeitch,com. Take a look, it’s a grab-bag of news, ideas, and graphics, which you may want to skim through. So it appears that all these home-made-mags, and this blog, may actually be the real me! I loved doing animated films, which combine nearly all the arts and crafts, and all of my fragmentary abilities into one, but not really possible or practical for one person to do alone. Just look at the mass of names on the seemingly endless scroll of credit titles on any current animated feature-length movie! But starting with my father’s typewriter, the carbon paper, the rubber stamp alphabet kits, the toy printing presses, the hectograph gelatin, the mimeograph, the early heat-sensitive copiers, the Xerox machines, the dot-matrix printers, the ink-jets, and now the internet and computer blogs….. since the age of 8. I’ve been, and still am, fascinated with using whatever works, to duplicate and disseminate my brain-doodles to whatever private audience I can grab. It’s something I don’t need a whole studio full of people to do. I could do it mostly all by myself, or with a single tech partner – all the way up from age 8. All the way to this very blog! I realize now that personal communication is what gives me the greatest kick! I hope you’ve gained something of what I’ve enjoyed Showing and Telling. The next and perhaps final phase of my drive to communicate, will see “Roll The Credits!” morph into “The Deitch Dungeon.” It’s creaking doors are already open. I’ll continue to fill it with documents, videos, drawings, writings and contentious opinions relating to animation and other matters about which you may decide I know zero, or that I’m just a crotchety old fossil. I will welcome you to tell me off if you have different opinions, so that in my dotage I’ll still have a chance to learn something! Additionally, I will continue to add new stuff to existing Credits 1-62. So be on the lookout for surprising up-chucks, frequently without any notice. So until further notice, I’m still not ready to say……. 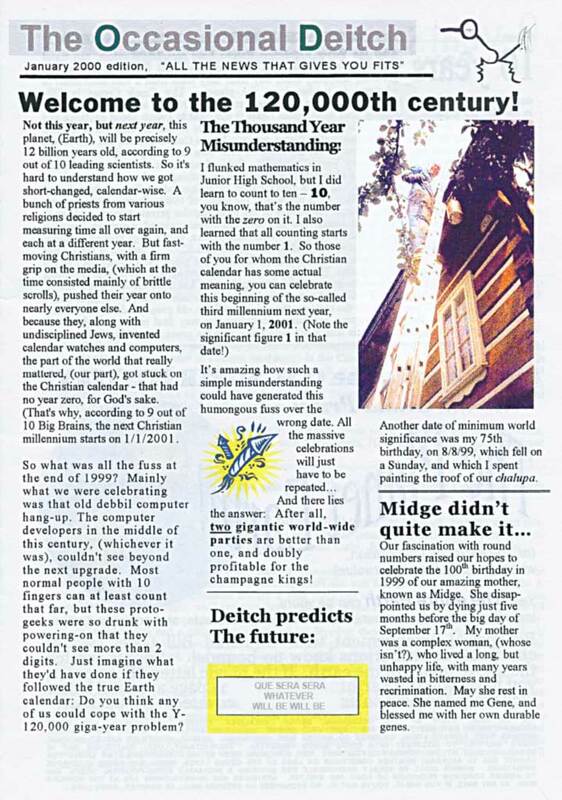 The first issue, done on an early dot-matrix printer. 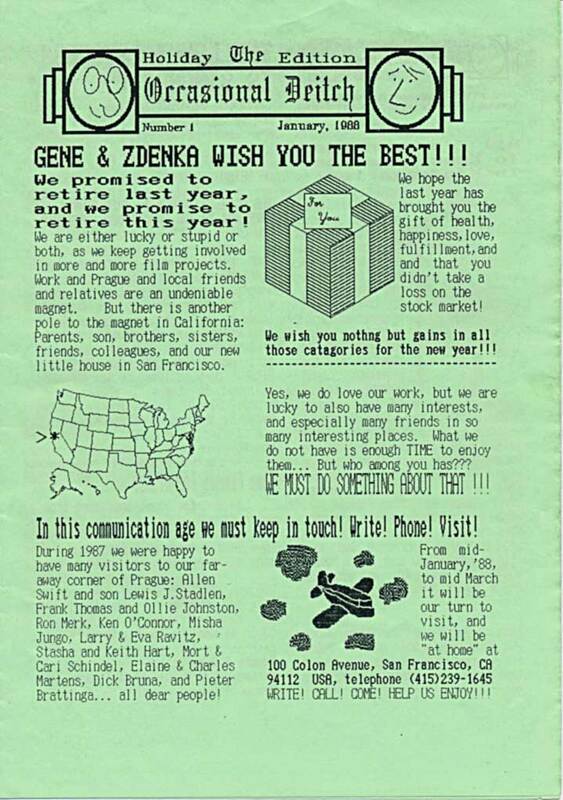 The final printed issue, year 2000. Now go to genedeitch.com, and see it today online! Loved this site, Gene. What a ride it was! Jerry, it should not only be a book, but a movie – live-action with animated sequences. Don’t you agree? Yeah, we’ve been through this, Steve, but where in the world could we find anyone who could play Zdenka?